Longville Parade, Friday July 4th -- ride or trailer your vehicle to Longville, meet at the Salem Lutheran Church parking lot at 10 a.m., where we’ll unload ATVs, and decorate them with flags. Bring candy to toss. The parade starts at 11 a.m.
Hackensack Sweetheart Days Parade, Tuesday July 8th -- ride or trailer your vehicle to Hackensack, club will stage its vehicles at 4:30 to 5 pm, on 1st Street, south of No Name Avenue. The parade starts at 6 pm. Bring some candy to toss and decorate your ATV! This year’s theme: History of Hackensack Area. It was a great club ride June 7th, with many new members experiencing a trail ride for the first time. Recent rains made the ride plenty fun...with no dust! See club Facebook page for photos. Help us celebrate the club’s 5th Anniversary! We’ll have a 1 hour meeting, with board elections, a half-price helmet sale (Polaris donated 50 helmets, shirts and RZR accessories. Thanks Polaris! ), and a club ride to Huddles for lunch! This is always fun. Club gear also available. Location: Bursch cabin on Stony Lake. Directions from Hackensack: East 2 miles on Cty. 5, then north 3 miles on Cty. 122, road turns left (Stony Drive), go 1.5 miles, right at Y, then first left (Stony Loop). Watch for signs. For more information send email to club president Dave Halsey: dvhalsey@aol.com. Big news for young riders: MN DNR Now Recognizes ASI and MSF Safety Training Certificates -- There are two new ways for young riders to be safety certified. Thanks to a new state law, promoted by ATVAM and ARMCA, the MN DNR now recognizes the ASI ATV RiderCourse certificate and the MSF Dirt Bike School certificate for young riders to legally ride on public lands. Earlier, only a certificate from the DNR’s ATV CD & Safety Training Class or OHM Safety Training CD were recognized. This is a huge step forward, bringing MN in line with other states that recognize these national rider safety courses for young riders to be certified. According to Leland Owens with the MN DNR, riders should carry their MSF or ASI certificate when riding on public trails. Plan Now For Club Ride To Roseau -- Our club rides this year include an overnight in Roseau at the ATVAM Fall Ride & Rally on September 19-20. The Friday VIP ride is always fun, riding with 15 or more DNR folks and state legislators. This year it includes a Polaris factory tour (their 60th anniversary) and a BBQ. Saturday there will be guided rides on some great trails. Book your lodging now at the AmericInn in Roseau, at this link: http://www.americinn.com/Hotels/MN/Roseau. If full, there are 4 other hotels in Roseau, and campgrounds available for those who wish to camp, which you can find doing a Google search. Options: Drive to Roseau Thursday for the Friday VIP ride and Saturday rides and ATVAM banquet. Or drive up Friday for the Saturday ride and banquet, returning Sunday. The club will be providing more details as they are made available by ATVAM and the ATV club in Roseau. Club Ride August 9 at Moose River ATV Trail -- Meet at the trailhead parking lot, off State Hwy 6 north of Outing (same location as last year) at 9:30 a.m. We’ll ride the Moose River Trail, have lunch in Outing at the Village Inn, return by mid-afternoon. Directions from Longville: east on Cty 7 to State Hwy 6, south on SH 6 about 4 miles to Ben Draper Road (big sign), go left 1/2 mile to trailhead parking lot. More Club Rides? -- If you would like to organize a club ride on a weekday or weekend, in addition to those already scheduled, send an email and we’ll help spread the word. Hoping To Wrap Up 2014 Dues -- Thanks to everyone who has sent in their club dues for 2014. The response to our mailing to all members -- which included a membership card -- was great! We’d like to wrap that up, so if you haven’t renewed, please send your check today ($20 Family / $10 Individual / $25 Business) to Woodtick Wheelers, PO Box 83, Hackensack, MN 56452. 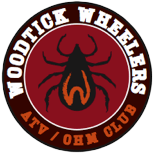 Thanks for belonging to the Woodtick Wheelers, celebrating 5 years of club rides, trail projects and OHV safety education in the Hackensack/Longville area.